Dubai, United Arab Emirates, October 14, 2018: Having firmly positioned itself as the King of the Desert with bullet-proof reliability and exceptional off-road abilities, the Toyota Land Cruiser also dominates the concrete jungle, as the 2019line-up sees the introduction of the ultimate urban-spec SUV, the Grand Touring edition (GT) that comes with a host of features, designed to make city driving even more fulfilling than ever before. Adding to the existing line-up of the entry level EXR, GXR and top-of-the-line VXR, the new GT edition, available exclusively in the GXR grade with a 4.0-litre V6 or 4.6-litre V8 engines, introduces a variety of features that underscore its urban-biased personality. “The Land Cruiser’s legendary off-road performance is recognized globally. The flagship SUV has also played an integral part of the UAE’s fabric for over six decades. The introduction of the diverse 2019 lineup allows us to cater to the UAE like never before, offering urban and off-road features that can conquer our discerning customers’ demands in the city or on the dunes. 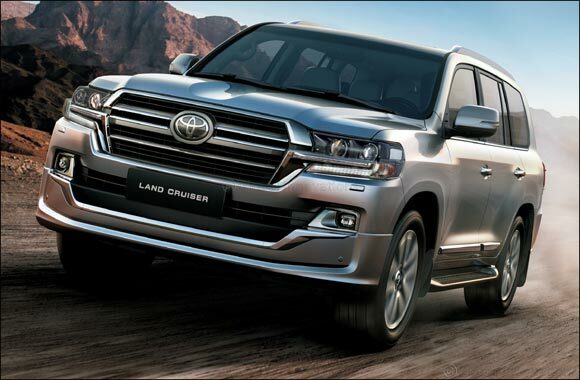 We are confident that the new Land Cruiser Grand Touring will be a runaway hit with those who desire an urban SUV unlike any other,” said Saud Abbasi, Managing Director of Al-Futtaim Toyota. Available with three different engine capacities, the 4.0-litre V6 delivers 271 horsepower and 39.3 kg-m of torque, the more powerful 4.6-litre V8 makes 304 horsepower and 44.3 kg-m of torque and finally, the 5.7 – litre V8 delivers 362 horsepower and 54 kg-m of torque. Made for the raw off-road lover, some of the key standard features on the EXR include a 7” Display Audio, Integrated Roof Rails, Air Compressor, 18” Alloy Wheels, led headlights with DRLs, Moquette Seats, Side & Curtain Air Bags and Crawl Control to name a few. The GXR grade which now also features the Land Cruiser GT in two engine capacities the 4.0-litre V6 and 4.6-liter V8 is also available in a larger 5.7-liter V8 engine. All variants are equipped with leather and wood trimmed steering wheel, powered seats finished in sumptuous leather, wireless charger, illuminated front and rear door sill scuff plates, chrome package, cruise control, centre console cooler box, a premium audio system, side curtain airbags. The Legendary Land Cruiser VXR is Toyota’s ultimate SUV combining sophisticated blend of road dominance, comfort and unparalleled refinement. The VXR comes standard with features such as multi-terrain monitor with 4 cameras, active height control suspension, pre-collision system and lane departure, blind spot detection and rear cross traffic alert, led interior roof lighting, 10.1” rear seat entertainment and underbody lights.